Director: Branden Chambers & Eric Chambers. Rated: R. Runtime: 83 mins. You're not hallucinating. It's the legendary toker jokers Cheech & Chong as you've never seen them before -- in their very first Animated Movie. Catch the buzz as their most outrageous routines and laugh-out-loud lines from their Grammy Award-winning albums come to life, including "Dave's not here," "Let's make a dope deal" and more. With help from a , bud-lovin' body crab named Buster, Cheech & Chong deliver the ultimate comedy high and give you the munchies for more. 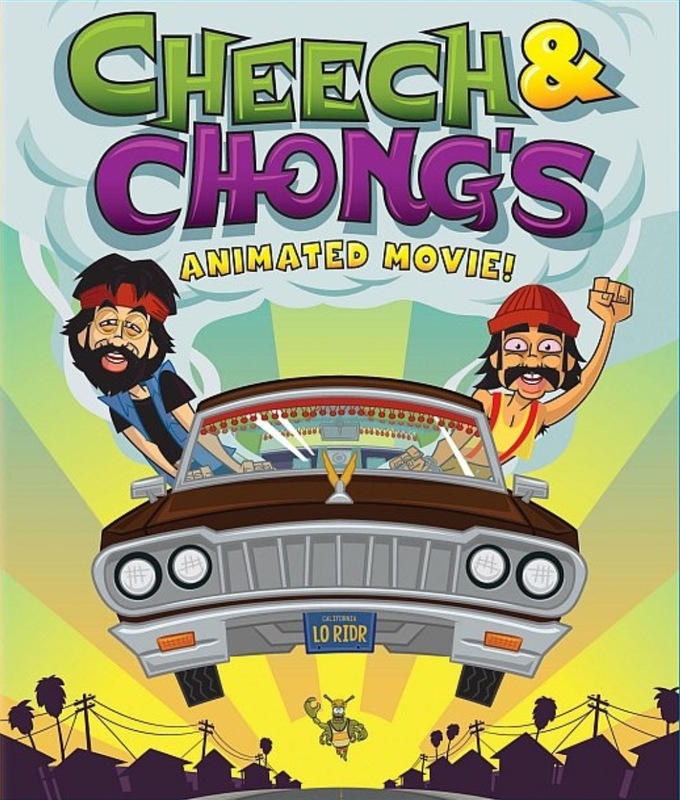 Also, pick up the Cheech and Chong's Animated Movie! Musical Soundtrack Album. We don't want to be a Debbie Downer, but most of the reviews for Cheech & Chong's Animated Movie! are horrible. The movie was officially released today. Let's start with other people's reviews and then we'll give our own. "...greatest hits album of old bits, interpreted through the click-and-point miracle of modern cartooning. Strictly for the faithful, the feature is essentially a victory lap for the pair, recycling their brand of drugs-n-fart humor in an attempt to entice a new generation of stoners aching to see such antics colorfully rendered onscreen." and "As far as I can tell, there’s nothing new about the material with the exception of a few songs and some transitional material (including the nonsensical Buster adventure), leaving the feature old news to longstanding admirers of the duo, while newcomers might be baffled by the disjointed nature of the picture, left without comedic history to successfully compute the onslaught of drug ingestion situations and bodily function humor. " "This played out cash grab from comedy veterans will most likely only appeal to the most immature or die-hard fans." and "I barely made it through the whole movie. I will say that older hippies that own every Cheech & Chong record will probably get some laughs out of the movie, but for everyone else I would suggest avoiding it." and "It feels borderline insulting that they just added cheap looking flash animations over old bits and labeled it as a new movie instead of coming up with some new, solid, material. It’s only been a few decades since their last film, I guess they needed more time." "...it's not the CGI-type of animation, so that could be the only part considered “fresh” in this film. But it's really retro, old-school, Flash-style animation, and it looks ugly." and "Cheech & Chong’s Animated Movie is something that could have worked, if the filmmakers decided to actually put some thought into it, rather than use what was already done before and put it in a different setting." Steve Bloom of Celeb Stoner liked the film. He says the cartoon design was "top notch." Yet, he did admit he was the only person in the New York City theater on the only night it was playing there. Keep in mind that Steve Bloom is friends with Cheech and Chong and sees them backstage at every show and appearance in the NY, NJ, PA, CT area. In addition, he promotes them a lot. The creators of Cheech & Chong's Animated Film! said they were going to tie together tracks from their old albums and make a story. We wondered how they were going to do this. They didn't do this at all. Instead, they animated their old bits and had Buster the Body Crab bounce from scene to scene. Cheech and Chong said they got this idea from the squirrel in the film Ice Age. It was kind of cool to see the sketches animated because if you listen to their old albums, there's a lot going on in the background which you may have missed. Cheech and Tommy recorded some new songs for the film and to make money off the soundtrack. The songs are annoying. The animation looked like it was done in Adobe Flash. It should have just been a movie on YouTube or Funny or Die (for free). People that have never heard their albums won't understand the movie. Fans of their albums will get bored. We're fans so that's why we even gave it a C.
Richard Marin and Tommy Chong each got paid $100,000 cash to use their likeness, sketches and promote the movie. The quote we heard from Tommy was along the lines of "this is the most money we [cheech and tommy] have ever been paid at one time in our lives." Tommy and Shelby were earning approximately $5k/night before Tommy went to prison. Their rate increased to $8-10k/night after he was released thanks to Josh Gilbert's film a/k/a Tommy Chong. We don't know what the legendary Lou Adler got paid, but it's definitely a lot more because the entire film uses the albums he owns. One of the people that bankrolled this film was Johnny Fratto of Howard Stern/Eric the Midget fame. We like Johnny. We hope he breaks even. This is a low budget film, but still too high for what was delivered. Note: Customers outside the US will be notified via email of additional shipping costs. Copyright Traced, Inc. All images copyright to their respective owners. All rights reserved.